Posted mainly for the international crowd. Buyer’s Order for my ‘14 Foz purchased used in 2015. “List Price” $16,495 plus $406 in accessories (window tint and a cargo floor mat) plus fees totaled $18,332. I paid $3000 down and financed the $15,332 balance. Of the fees, $229 goes to the dealer and the rest to the state of TX. Nearly all dealers in the US charge these silly dealer fees that are basically a way for them to raise the price after it’s already been agreed to. I’ve seen it as high as $450 at some dealers, so my $229 here wasn’t too bad. Also note that the trade-in allowance is between the list price and the taxes. 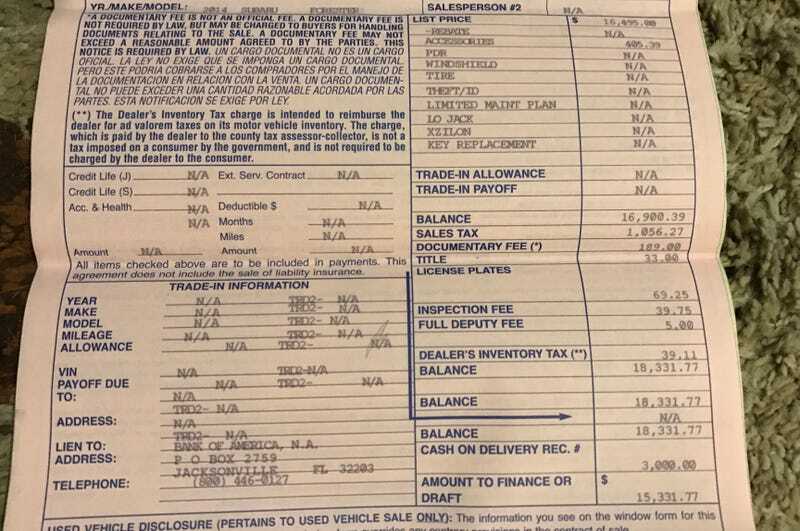 If you trade a car in to the dealer, you only pay the sales tax on the difference in price between the car being purchased and the trade allowance. The rest of the fees stay the same. So in summary, the agreed to sale price of the car and accessories of $16,900 became $18,332 total with tax and fees.